Moscow, June 30, Interfax - On Sunday, Ukrainian army shelled residential districts of Slavyansk again, St. Alexander Cathedral was under fire. “The shelling started in 10:00 a.m. during the Liturgy. People started singing “Our Father” when the first volley was heard from the Karachun Mountain. Then there were several volleys, a shell damaged the bread kiosk located in several meters from the church. It was torn to pieces, everything there was burnt. The shop assistant ran out when she heard the first volley, it saved her life,” the local diocese cites Archpriest Nikolay Fomenko as saying. There were about thousand people at the church territory, many of them expected distribution of the humanitarian help, that was carried out near the cathedral. “After the shooting began everyone rushed to the church. The cathedral was filled, people prayed to God with tears. The shelling wave broke several stained-glass windows, people started praying even more ardently. The shelling lasted about half an hour. The Artyom Microdistrict and the central market were also shelled,” the priest said. No one was injured at the territory of the church, the church also wasn’t damaged. It is the seventh time when Ukrainian militants shelled Slavyansk churches. On May 26, the mine killed a woman near the Church of the Derzhavnaya Icon of the Mother of God when the Artyom District was shelled. The pieces of the mine broke windows in the church, damaged its facade and destroyed the church fence. On the Day of the Holy Trinity, on June 8, the downtown Church of the Holy Spirit was shelled. 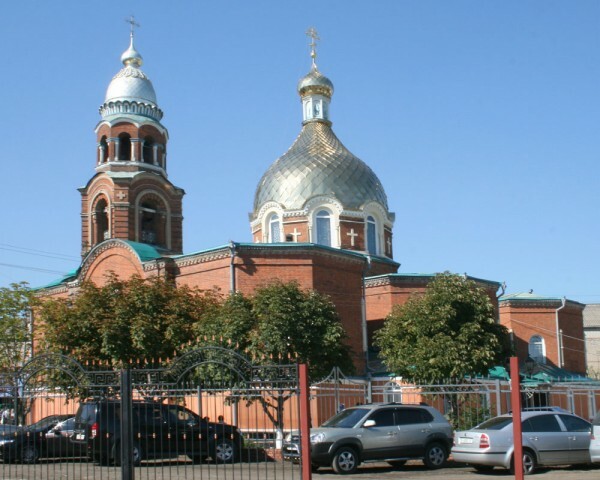 At night on June 16, St. Seraphim Church in Cherevkovka was shelled. The ward house and canteen were fully destroyed. The same day St. Alexander Cathedral of Slavyansk and surrounding territory was shelled. On June 19, the shelling target was the Resurrection Church built in the 18th century. Its ward was killed. On June 21, after Ukrainian President Pyotr Poroshenko announced armistice, St. Alexander Cathedral was shelled.